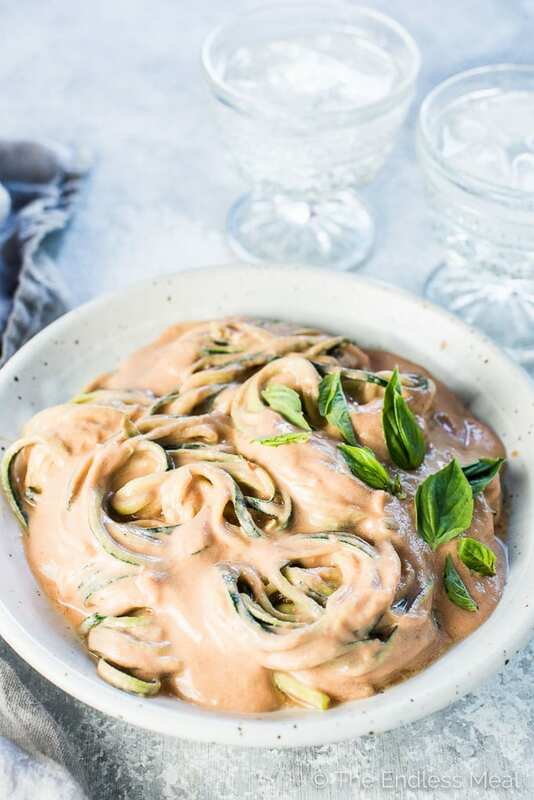 This crazy delicious Dairy Free Tomato Cream Sauce is truly the creamiest pasta sauce around. It tastes like it's made with a carton of cream, but it is 100% dairy free. Even if you eat cheese (like I do) you will LOVE this healthy recipe! It's also paleo + gluten-free + Whole30 compliant and can easily be made vegan. Here's what you need to know: I'm literally doing a happy dance I'm so excited to share this recipe with you. It's embarrassing, but it's true. I've been updating some older blog posts and came across the Tomato Cream Sauce recipe I shared with you back in 2013. I love love loved that recipe, but haven't made it in years because I so rarely add cream to my recipes. For a few minutes, I thought of turning that post into a Throw Back Thursday post, but I still didn't want to pour 2 cups of cream into my pasta sauce. Note: If you're down with cream, don't hesitate to make the recipe! That's right, cashews win again! Those little gems are the secret to making dairy-free everything as creamy as the real deal. They're what I used in the Not Yo Mama's Pork Chops and Mushroom Soup recipe. They also showed up in the Cashew Butter Chicken and have been used in nearly every vegan ice cream recipe on the blog. I'm a little obsessed with the magic of cashews. Once they have a little soak in some water, they soften up enough that they blend into a beautiful cream-like sauce. When you add them to the pan, this is what happens …. Do you see how creamy that sauce is? That's all because of the cashews. 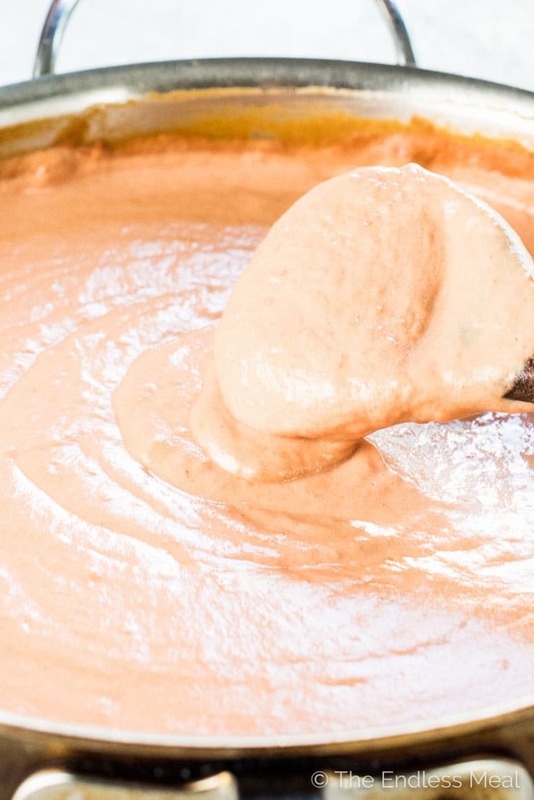 Without them, there would be no dairy-free tomato cream sauce. I mean, we might be able to come up with other ideas about what to use, but we really don't want to. I've seen attempts to make dairy-free tomato cream sauce with things like coconut milk. All I can say is, “ugh nooooo!” Please don't do that. Unless you want a coconut tomato sauce to pour over your pasta (and I'm assuming you don't cause that is just too weird) then don't use coconut milk. Save that for your curry and use cashews when you want a real, Italian-style dairy free tomato cream sauce. To zoodle or not to zoodle, that is the question. What you put the sauce on is your choice, my friend. I almost always opt for veggie noodles (99% of the time zucchini noodles), but you can use whatever you like best. My handsome man always has his on spaghetti. Rigatoni, penne, or cute little shells would work just as well here. If you want real pasta, but want it to be gluten-free, try spooning the sauce over Chickapea Pasta. It's my fav gluten-free pasta, and the one I used when I shared the Deliciously Rich Lentil Bolognese recipe with you. Before you scroll down to the recipe, I should warn you that there's an ingredient that might seem a little out of place in here. The original tomato cream sauce recipe had prawn stock or clam juice in it. When I was creating this Dairy Free Tomato Cream Sauce, I wanted to stay as true to the original version as possible. Because prawn stock is something you have to make, and clam juice is not exactly a pantry staple, I decided to opt for fish sauce instead. You know, that super stinky Asian sauce you have hiding in the back of your fridge. Ya, that. See, I told you it would seem out of place. The thing is, adding fish sauce (or prawn stock or clam juice) to the sauce makes it extra rich and delicious. Don't worry, it doesn't give the sauce a fishy taste. That would be weird. It just adds that something extra that's hard to nail down or put your finger on. It's like adding salt to a recipe and trying to describe the effect it has. It makes it better, richer, and more delicious, but impossibly hard to describe. Heat the oil in a large saucepan over medium-high heat. Add the onion and cook until it is soft and starting to brown. Add the garlic and cook for 1 minute more. Transfer the onions and garlic to your high-powered blender or food processor. Add the cashews and 1 1/2 cups of water and blend on high until completely smooth. Pour the cashew cream back into the pan and add the crushed tomatoes, sea salt, and (if using) the fish sauce. Whisk well and heat through. 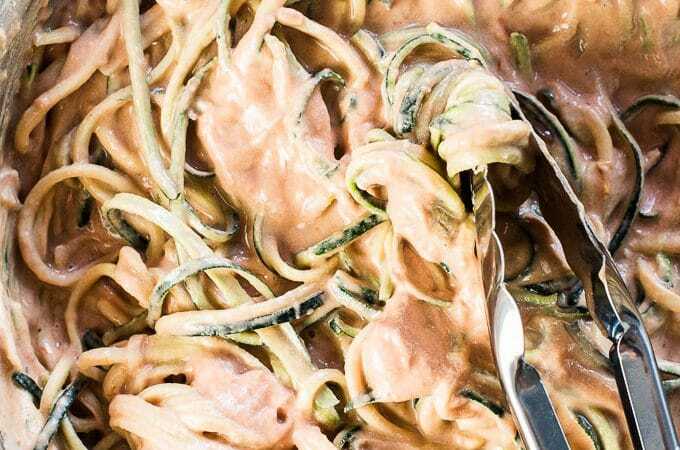 Serve the dairy-free tomato cream sauce over pasta or zucchini noodles. 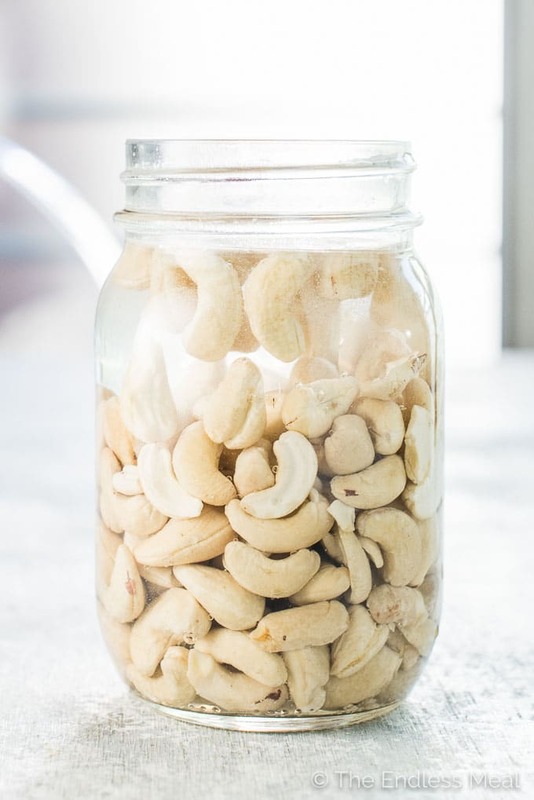 If you don't have a high-powered blender, soak the cashews in water for 3-4 hours before using them to make them easier to blend. Simply put them into a jar, fill the jar with water, and pop it into your fridge. Discard the water before using the cashews. Fish sauce might seem like a funny ingredient to use, but gives the cream sauce a ton of deliciously rich flavor. It can be found in bottles in the Asian section of your grocery store. Whatever you do, don't smell it! I'm serious. It's really stinky, but it tastes amazing. I am thrilled to have found this!! It was delicious! I’m on a low mold diet so I omitted the fish sauce & it was still so good. My husband said it’s restaurant quality & I agree. Thank you for sharing a recipe that makes me feel normal again. I just need to come up with other ways to use the sauce…any ideas? Over fish? Beef? Super easy and incredibly delicious! Thank you so much for this great recipe!! I’m always looking for great dairy free recipes and this one is one of the best I’ve tried. It’s so creamy! Thank you for sharing it.